Vs Collection is an unusual multi-player versus/fighting game by Bottom Up. It is rather difficult to categorize this title and it doesn't really fit into any genre at all. In a nutshell, Vs Collection offers four different multi-player mini-games, all staring some king of cute penguins (or weird looking chickens, hard to tell, let's assume they are penguins). 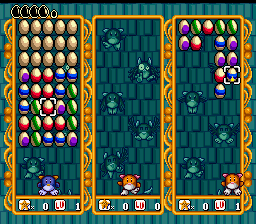 The first one is a Tetris-Like game called Tamago Baakun where up to three players collect colored eggs and align them to send disastrous baskets of egg yolk into their opponents' playfield. The second game is an intense snowball battle called Yukidama Poi Poi - two teams of penguins (aligned like in a game of chess) fight by throwing snowballs at each other. And, of course, the last team standing wins. The third mini-game is a racing game called Doki Doki Race, and is based on other titles such as the classic Super Mario Kart - but things here are much simpler, and the penguins have to race around a small track, and can occasionally jump over walls and take shortcuts. The fourth and last game is a fighting game called Toria Taaku where up to four penguins fight one another in a way similar to Atari's classic Joust. The goal of this last game is to kick the other players, and to throw them in a large pit located at the bottom of the screen. Released on November 29, 1996 in Japan for 6980 Yen.